Thank you for creating this masterpiece series. 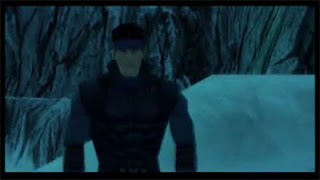 METAL GEAR SOLID NEEDS AN HD REMAKE!!! I still remember the first time I played Metal Gear. Not Metal Gear Solid for PlayStation, I mean the Nintendo version. It was at a kid named Preston's place and we thought it was the coolest game ever, as you could smoke cigarettes. As I still have the game and have replayed there has grown more respect and liking for it. Clearly my younger self (8 or so years old) failed to grasp the story and nuances of the game. Well, years went by and I was working a prestigious position in a Wal-Mart... all right, in the McDonald's inside the Wal-Mart- and I found the demo in for Metal Gear Solid for PlayStation in the electronics section while roaming around the store during break time. This simple demo immediately had me hooked. A game of stealth. Sure one could run in and kill anything that moves or you could slip by undetected. No fighting needed. Stealth was the better option. This was something new to me. Intrigued, I would spend most my breaks running back and playing the demo repeatedly. I was hooked. Once the game came out- pretty much all my friends and I spent all our free time playing this game. 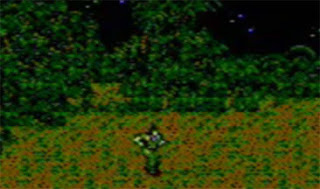 Obsessively searching codec channels and looking in all corners of the compound for secrets. I decided to silently kill every enemy as many times as possible. So I got to sneak AND kill the bad guys. My end game ranking for the first playthrough was: ORCA. I also loved the ranking system. Based on miscellaneous criteria like amount of times alerting enemies, saves, kills and how many rations you consumed as well as the level of difficulty you played it on. Brilliant! This game also had the benefit of having a layered story. Dramatic action, wonderful and interesting characters, and bleak Alaskan setting balanced with enough humor to make you laugh out loud at just the right moments. 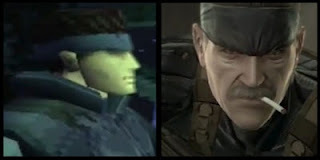 Solid Snake- Then and Now- Look at what smoking does! There is a real need to remake the PS1 Metal Gear Solid. With full trophy and complete graphic update. A complete overhaul. Like many old gamers I would pay full price AGAIN! Not to mention all the potential NEW gamers could be introduced to this earlier Solid Snake. The remakes of 2 and 3 into HD were good, but Solid would be an EPIC remake. The Twin Snakes update was ok, but it needs the MGS4 visual overhaul. It needs the update. No expenses spared. The game was solid in story, solid in gameplay, and solid in characters. This is a game for all time. Only a select few game makers can create such a distinct and moving work. These games transcend the times. Mr. Kojima could enhance or add all the things he wanted to in the original but had to cut for whatever reasons were necessary back then. This is one of the few games that I would definitely insist on a remake for. Maybe even have a remake/update of the NES version as an add on or DLC??? Solid Snake has come a LONG way- his story is great, and I would love to enjoy the journey with him again.